At our house we read many books a night and use different voices for every character, but I have to admit that I never make up my own bedtime stories. After watching Disney’s movie Bedtime Stories, recently released on Blu-ray and DVD, I believe creating bedtime stories with our children is a tradition that none of us should miss out on. Sandler’s character, Skeeter Bronson, finds himself in a search for his own happy ending. Although if you could ask him, Skeeter would tell you that there are no happy endings. When he is asked to babysit his sister’s children — in a house with no t.v. — Skeeter creates wonderful bedtime stories that have the children enthralled with the leading hero (Skeeter always casts himself as the hero). Once the children become active in evolving the slumber-time narratives, true Disney magic arises — the action-packed adventures become a reality for their uncle. 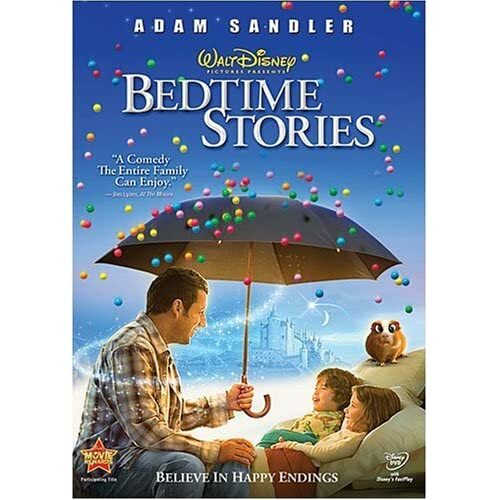 Bedtime Stories is clever, entertaining, good-humored and whimsical, everything you would expect to see in an Adam Sandler movie made by Disney. The message this movie sends to people about the power of creating your own bedtime stories is admirable. Definitely worth watching! Creating great bedtime stories with your children is a true bonding experience — it can only bring you closer. Your fun is only limited by your imagination. Children who are encouraged to use their imaginations are happier. True magic happens when children are encouraged to participate. Great ideas to spur the imagination can often begin from your days experience. This also allows for opportunities to resolve any issues that may have come up during the day. Always remember that when you reach a sad point or the bleakest moment (in life or storytelling) this is the cue for the hero to step in and do something unexpected. If it isn’t happy it’s not the end! Link: Disney’s Bedtime Stories web page.